1. Mix the flour, sugar and bicarbonate of soda in a mixing bowl with a pinch of salt. Make a well in the centre and pour in the buttermilk and egg, whisk together until smooth, then set aside for 30 minutes. 2. For the butterscotch sauce, melt the butter in a small saucepan over a medium heat, then add the sugar and allow to dissolve. Simmer for 4-5 minutes, stirring regularly, until golden. Take off the heat and stir in the cream, vanilla and salt. 3. Heat a large frying pan over a medium-low heat. Melt a knob of butter, then add a small ladleful of the batter and spread to a circle roughly 12cm in diameter – cook 2-3 at once, if possible. Flip after 2-3 minutes when bubbles appear, then cook for another 2-3 minutes. Repeat to make about 8 pancakes. 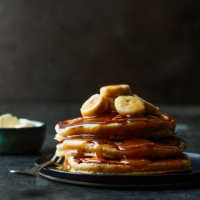 Stack onto plates, top with the banana and spoon over the warm butterscotch sauce. Serve with whipped cream too, if liked. Don’t worry if the butter and sugar look separated as they melt and simmer, as the sauce will come together when you add the cream. This recipe was first published in Thu Feb 01 14:08:27 GMT 2018.